Nothing. Absolutely nothing. If you examine his game, there are zero weaknesses. Traditionally, the backhand is the weaker side. Take a look at Nadal or Sampras or Federer or McEnroe. The one area of vulnerability in their arsenal is the backhand. Not Djokovic. His two-handed strike is one of the all-time best. He can smother it on-the-rise crosscourt or he can lambaste a down-the-line stunner. He serves 125-mph aces. His forehand topspin is offensive and offers a wallop. He has a deft dropshot touch and his defensive skills, turning a losing point into a winning shot, is peerless. Few players in history have had a better season than Novak’s 2015. He triumphed in Melbourne during the Australian Open. He outsthone the competition on grass at Wimbledon. He conquered Federer’s SABR (long-named Sudden Attack By Roger) to prevail in New York’s U.S. Open. And, at the French Open — where my own bare eyes got to see his magic at Stade Roland Garros — he won his first six matches and was nearing his first clay-court Grand Slam title when he was disquieted by Stan Wawrinka. Still, when you win 27 of the year’s 28 Grand Slam singles matches in a 64-win, 5-loss season — that’s outstanding. Why, then, the title (above)? Because as fascinating as Novak Djokovic’s record shows, he’s not as celebrated and loved as his two main tormentors named Roger and Rafa. Ask any tennis fan who among the Big Three they idolize and chances are the reply will either be R or R. Why not ND? Firstly, the Serb still trails the Swiss and the Spaniard. When we talk of major titles, Roger Federer leads the pack with 17 .That’s followed by the 14 of Rafael Nadal. Plus, through the years, Roger and Rafa have developed a special and emotional bond with their fans. Both their games, to start with, are different. One is right-handed; the other, a lefty. One attacks with flat, offensive strikes; the other, with a looping uncontainable spin. And so for so many years, Novak has been the Supporting Actor in a tennis movie that starred two Leading Actors. Not anymore. Two nights ago, when I arrived home past 9 p.m., I turned-on the TV set and pressed “701.” It was the championship game of the China Open in Beijing. This site brings back memories because it was in 2008 when they unveiled the tennis center during the Beijing Olympics. Eight Augusts ago, Jasmin and I watched Nadal win the Olympic gold. Last Sunday, he looked like tarnsihed gold. Against Djokovic, he was getting clobbered. When I watched, the score read “6-2, 4-1.” Nadal, who did not win a single major title this year (the first time it’s happened since 2004), has been playing dull and subpar tennis this season. Having won 9 of the previous 10 French Opens, he lost in the quarters in Paris (to, who else, but Novak). Rafa whipped his forehand, sliced that backhand, spun and swerved his serve — all to no avail. Two games later, it was over, 6-2, 6-2. It’s not like Nadal, who, at 29 is a year older, played badly. It’s just that Djokovic is the Ronda Rousey of tennis. He’s unbeatable. Looking at the statistics of the Novak-Rafa match, it offered extraordinary numbers: Novak scored 7 aces to zero for Rafa. His first serve percentage stood at 82 percent. He amassed 16 winners to only 7 from Rafa and won 62 vs. 43 points. 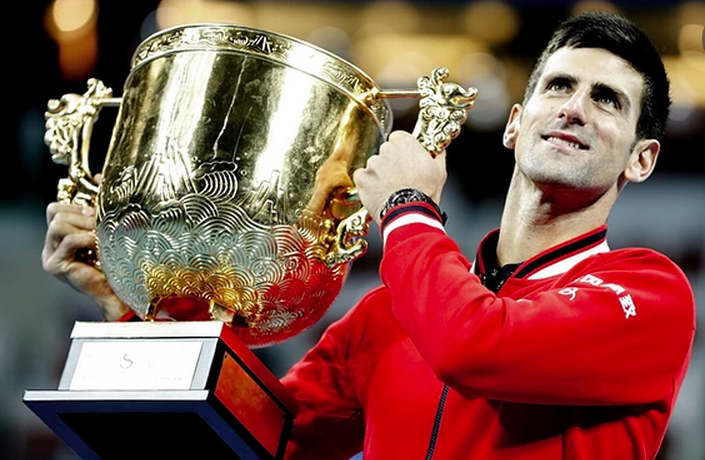 In the whole China Open, just examine the scores accumulated by Djokovic (6-1, 6-1, 6-2, 6-1, 6-2, 6-2, 6-2, 6-3, 6-2, 6-2) en route to winning his sixth China Open title in as many tries. But going back to the “Roger and Rafa are more loved than Novak” line, the Serb is just as nice and is trying hardest to be loved by fans. Moments after his win last Sunday, he scribbled a Chinese character on the TV screen. Then, in the post-match interview, he spoke a few words in Chinese — to add to the five languages that he speaks (Serbian, English, French, German and Italian). What a world No. 1.